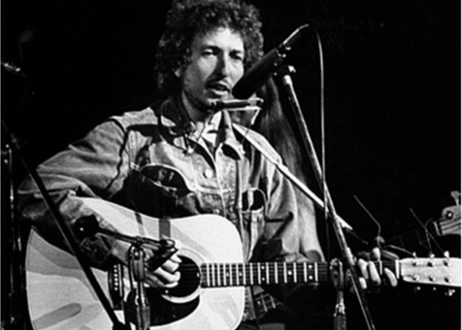 Bob Dylan's Martin D-28 acoustic guitar that he used at George Harrison's 1971 Concert for Bangladesh is up for auction with an opening bid of $300,000. You can bid on it here, if you've got an extra half million sitting around. Dylan played the guitar through his entire set at that historic 1971 show, blazing through a mini-set that included "A Hard Rain's A-Gonna Fall," "It Takes a Lot to Laugh, It Takes a Train to Cry," "Blowin' in the Wind," "Mr. Tambourine Man," and "Just Like a Woman" with the help of George Harrison, Eric Clapton, Leon Russell, Ringo Starr, and other notable musicians. The guitar was also used during his entire Rolling Thunder Revue tour from October 1975 through May 1976, as well as on countless other dates. In 1977, he sold the guitar to noted guitar-tech and musician (not to mention, Dylan's guitar repairman at the time) Larry Cragg. The guitar displays wear commensurate with stage use, but respectful wear in the form of the usual light scratches, dings and dents, moreso at the upper edge of the back of the guitar, likely the result of a harmonica holder or the metal buttons of a blue jean jacket. There are some stress cracks running from the bridge. Bridge pins are original, and it has Grover tuners. The guitar includes its original hard shell case. In 1977 Dylan decided he wanted to play Gibsons instead of Martins, so he offered two 000-18s and a D-28 for sale. Larry Cragg, working as a private guitar tech, was offered the three guitars at Dylan's home in Malibu. He bought the D-28 on the spot for himself and took the other two back to Prune Music in Mill Valley, California to sell on consignment. Thus it was that Cragg acquired "Bob", which he has owned to the present day. According to Cragg, he has kept the guitar in a humidity-controlled environment, with loosened strings for the forty years it's been in his possession, and it has not been played since it was wielded by Bob Dylan in 1977. The guitar is accompanied by a letter of provenance from Arthur Rosato, Dylan's jack-of-all-trades at the time, describing the circumstances under which Cragg acquired the D-28. A copy of the bill of sale dated April 8, 1977 is included. The Prune Music receipt reads: "Bought from Bob Dylan Martin D-28 #196405 and case for $500.00". The guitar is also accompanied by two photocopied articles about Larry Cragg, one from a 1977 issue of Guitar Player; the other from a 2016 issue of Acoustic Guitar. This is a veritable treasure for the Dylan faithful, and a piece of music history.